The Paris-based illustrator lays bare his band-aided portraits in his first solo exhibition at the Brachfeld Gallery. 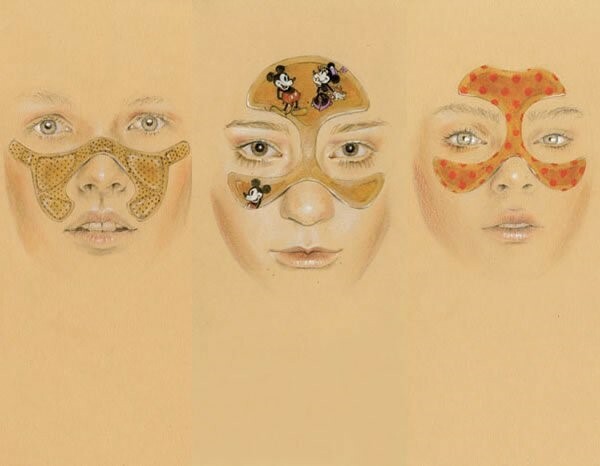 Paris-based artist Cédric Rivrain has been drawing since the age of 18 and has illustrated and designed for prestigious fashion houses including John Galliano, Martine Sitbon and Yazbukey. He grew up in a medical environment and combines this background with his fashion experience to create more personal work, opening up a door into delicate and dreamy scenes that feature self-portraits and depictions of friends such as Natasha Ramsay, Olympia Le-Tan, Masha Orlov, Charlotte Chesnais, Lily Cole and Chloé Sevigny. The significance the anatomical plays for him can be seen in the band-aids adorning some of his subjects, it's all that is covering their bodies or faces, as Cédric favours nudes over designer clothing. Through bandage and dissection he distances himself from fashion to uncover its inherent beauty. Drawings is his first solo exhibition at the Brachfeld Gallery in Paris and he has previously shown at Maria Luisa, Le Bon Marché and Christie's and contributed to publications as diverse as Tokion, Numéro and A magazine. Dazed Digital: How did you become an illustrator? Cédric Rivrain: My first illustration was actually a double spread for Dazed and Confused. My friend Yaz Bukey, the jewellery and accessories designer, was offered this double spread to express herself. She liked my personal drawings and thought it would be a more poetic way to introduce herself – to have me drawing her and her fantasy world. That is how it all started. DD: What inspires you most in your work? their creativity and their slight craziness. I choose people I know. I need to be moved by them. Especially for this exhibition, all the models have been close friends of mine for years. They all inspire me and mean a lot to me; those bandages and hands are my way to eternally protect and heal them. That is what I like about drawing. You engrave something for eternity. I also got a lot of my inspiration from my childhood, the mix of cultures my mother and father gave me were both very different. He was a passionate doctor and my mother was a very feminine woman who dressed in designer clothes and to whom appearance was very important. I grew up in a house full of antique medical books, illustrations, models and instruments. I guess drawing is my way of immortalising the particular culture my parents gave me. Eyes are also extremely important to me. Here again, my parents ones were the very beginning of this obsession. Theirs were both very clear, very expressive. I always knew how they felt just by looking at their eyes. Eyes are for me the essence of a person. They say everything. Expression of life lies in them. DD: Can you tell me something about your subjects, how do you choose them and why? Cédric Rivrain: It always comes naturally to me. It is a question of feeling and immediate envy. I do not anticipate too much when I work on a story. I let my hand 'write' it on the paper. I never really do sketches beforehand. When I start a drawing, I work on it until I feel I have said something through it. It is at the end that I understand myself what the whole thing was about. It just needed to come out, like a story to be told. But I guess it always relies on my own culture and fantasy. Like every artist, I have my inner world and drawing is my way to make it concrete, to make it alive. DD: Which is your favourite piece in the exhibition and why? Cédric Rivrain: They all are important to me. I edited a lot to keep only the ones I was totally happy with. Every single piece in the exhibition is important to me. Those drawings are like words in a sentence. If you take one off, the sentence doesn't have the same meaning anymore. DD: Is there a project or a new method of working that you would perhaps like to envision in the future? Cédric Rivrain: I just see myself keeping on drawing and going further in my obsessions and passions. This was a first show. My drawing is still shy and I am very curious myself to see how it evolves. "Drawings" at the Brachfeld Gallery from May 26 - June 16.